This post can also be found on the Orange Karen Tribute Anthology page. You can go there by clicking on the link provided. You’ll also find several other posts dedicated to helping me out by way of writing. Please check it out! It started like any other Saturday. Eric was rushing around trying to get the kids ready and I was being lazy not wanting to get out of bed. Until, that is, I realized what was happening this Saturday. That evening was our oldest daughter’s very first dance recital. I was beyond excited. If you know me you know I love theater, the arts, entertaining. The thought of my daughter following in my footsteps just makes me want to push her out of the spotlight and take her place. Just kidding. 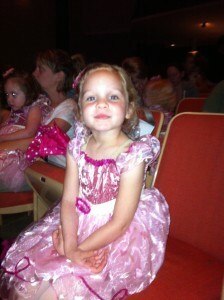 My little ballerina so excited to take the stage. As the day went on I started to feel tired, run down. I brushed it off thinking it was just the normal mom feeling of having to do everything in a short amount of time. I remember swaying back and forth as I tried to perfect her braid and scolding myself for doing a half-assed job. When we got to the recital I started to shake with cold sweats. Taking shallow breaths and hoping not to pass out in the wings, I watched my little ballerina hit every move. After her second dance I couldn’t stand any more and opted to go home to bed. 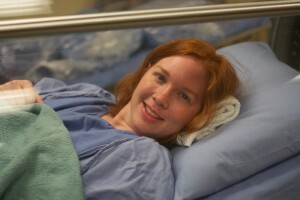 After tossing and turning that night and the following day with a high fever, Eric took me to the ER Sunday night. The night nurses took my blood, found nothing out of the ordinary, gave me fluids and sent me on my way, diagnosing it as a viral infection. Under this advisement I went home and spent all of Monday in bed as severe pain ravaged my body, especially in my neck, shoulder, and abdomen. By Tuesday morning I was vomiting and too weak to even stand. Eric and I actually discussed not going to the hospital because of cost but I soon felt too sick to care and insisted we go. We later learned that had I not gone to the ER that Tuesday morning I would have died Tuesday night. The total time from onset to fatality, four days. When Eric left that night I was just intubated, when he walked into the room the next morning I was hooked up to 13 different machines. My body went into shock and they couldn’t figure out why. Just overnight I lost blood flow to my hands and feet; the toxins then pooled where there was decreased blood causing an intense rash which then turned to blisters which popped open and left open wounds. Disgusting, angry, limb losing wounds. I lost my left thumb almost immediately. The infection was causing my body to throw out random clots to try to stop the infection from spreading. Four of the machines they placed me on are designed to pull your blood to your core to save your vital organs. The combination of my body’s instinct and the machines saved my heart, and my life, but they doomed my hands and feet. My family watched as my extremities turned black knowing there was nothing they could do to stop it. At one point I had 19 extra liters of fluid in my body. Think of a 2 liter bottle of soda. That’s a lot of soda. The doctors were stumped, they had no idea what was causing my sickness. 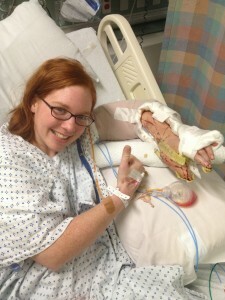 I was dubbed the sickest person in the hospital by the Dean of Medicine. I’m still waiting for my plaque. My heart was only pumping at 25 to 30% and there was concern that my body wouldn’t be able to handle the severe attack of the infection. However, thanks to the sheer determination of the many doctors and nurses on my case, a day and a half after they started antibiotics I started to turn around. At this point I was placed on hypnotics which allowed me to respond to the doctors but I would have no recollection of the events. I woke up 10 days later to my husband and brother looking down on me with big goofy grins on their faces, two days after that we had a cause. A culture finally came back with toxic shock antibodies. My infection had a name, and it was Toxic Shock due to strep. Yep, your everyday strep got into my blood and there you have it. It’s cause is still unknown. It was NOT caused by tampons, or the mud run I had just raced in, or anything like that. Somehow strep got into my blood and tried it’s damnedest to kill me. My age. I went through all of this, which includes mastering the bedpan, just a few short weeks of my 30th birthday. My strength. Before my illness I was working out five days a week, sometimes twice a day. I would have loved to have been awake when the doctor told my mom, who used to criticize my workout schedule, that my physical strength was one of the reasons I survived. I’m stubborn. My body basically refused to quit. They had me on enough narcotics and medicine to down a 300 pound man for a week, and yet I was struggling with nurses to remove my own tube, even tried to punch one who went to stop me. I struggled to let them know that I was still inside, that I was still fighting. During that week and a half in the ICU I was placed on a dialysis machine, had several blood transfusions and more than one central line put in to administer medicines. The last one I had went straight into my neck and into a main vein; it was put into place right before I woke up. I kinda miss that one. They’d put in pain meds and before they were down pushing it all in, I would be out. Until the one nurse left the syringe in my neck and I didn’t realize it. I brought my hand up and lightly touched around what they called the IJ (inter-jugular) pick. “Why, yes, yes it is.” And I went back to reading. He spent the rest of the afternoon calling me “Frankenwife”. After a month in the hospital and physical rehab facility I was released to go home on July 4th; a day that is now my own little Independence Day. I thought I was in the home stretch, but my recovery was only beginning. When the podiatrist first saw me he said the worst case scenario was double amputation up to my knees. No one should ever have to hear those words. I never felt so helpless in my life. I just kept thinking about my two little girls at home; how I could never dance or run with them again. 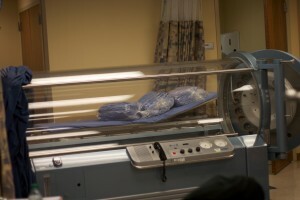 He recommended a hyperbaric chamber to help circulation in my feet to aid in the healing. For 55 days I spent two hours breathing pure oxygen at twice the atmospheric pressure. I laid in that gigantic glass tube, completely closed off from the rest of the world watching “Frasier” reruns on Lifetime. It could have been worse. My afternoons were spent at various doctors, cardiologists, hand therapists, and surgeons. With every appointment I continued to defy the odds. They told me that it would take at least six months for my heart to recover. By the end of July it was already back to normal. When August rolled around it looked like my feet were going to be saved, minus a pinkie toe. My thumb was still the only question mark. The first hand surgeon wanted to amputate it, sew my new stub of a thumb to my groin and grow a new thumb from there. Yeah. Let me just walk around with my hand down my pants for six weeks. I’m sure no one would notice. But thanks to a second opinion I am now working with a brilliant micro surgeon out of the University of Penn. I am currently undergoing a series of surgeries to reconstruct my thumb using tissue from my arm. I don’t remember anything from those 10 days in which I fought for my life. A part of me wants to but looking at the sadness in my family’s eyes when they recall that time I’m guessing it’s for the better that I don’t. What I do remember is waking up to two whole walls of the ICU room covered in get well cards. Nurses and doctors would randomly come in, hug me, kiss my forehead and thank God I pulled through. My social media sites, Twitter feed, Facebook wall, were filled with seemingly endless posts of prayers, well wishes and notes of people wanting to help. I have never been so overwhelmed in all of my life. I’ve learned a lot this past year, patience, humility but most of all what friendship and love really means. I’ve learned to be thankful for the smallest things and I’ve gotten pretty good at finding the silver lining in darker moments. Everyone who looks at my hands and my troubled gait say they’re so sorry that this happened to me. But please, don’t feel sorry for me; never feel sorry for me. I’m alive, and I’m in control of my recovery. But I am sorry. I am sorry for my parents. They had to watch their only daughter’s hands and feet turn black before their eyes, knowing there was nothing they could do to stop it. I’m sorry for my husband who called up his parents to tell them to come say goodbye to me and how he had to figure out what to say to two little girls about their mommy who went to the hospital and didn’t come back. But I’m most sorry for my two little girls who knew nothing of what was going on and just wanted their mommy to hold them. That’s who you should be sorry for, for my loved ones who had to watch me fight this and could do nothing to help. However, that is all in the past. So instead of feeling sorry, I try to remember to celebrate. I’m here for birthday parties, holidays, smelling honeysuckle waft through the air on a cool June night. And yes, I’m even excited to be here to potty train our soon to be three year old. Life is truly a blessed and beautiful thing. I have many reminders by way of scars, pain, and overall way of life that reminds what I went through to ensure that I have a life to live. Whenever pettiness and pride creeps in to ruin my day I just have to look down to my hands or feet to remember how precious life is and what really matters. I urge you to stop and take some time to yourself and be thankful for all that you have because within four days it could all be gone. *I want to quickly give thanks to everyone who has worked on this site, submitted posts, submitted stories for the anthology, and is currently working on putting everything together. Another big hug and thanks to all my friends and family who have rallied behind us during this trying time. To my doctors, nurses, therapists, pharmacies, and hospital staff, thank you for your dedication to help others. And last, but not least, my husband, Eric. Yours was the last face I saw before I went out and the first one I saw when I woke up. I want to keep it that way. ** I’ve posted a photo journal of my injuries over this summer. Feel free to check it out by clicking HERE. But please, it is not for the faint of heart. My toes and fingers were gangrenous and not the prettiest. 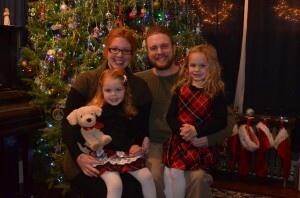 This entry was posted on Saturday, December 15th, 2012 at 8:00 AM	and is filed under Blog. You can follow any responses to this entry through the RSS 2.0 feed. You can leave a response, or trackback from your own site. This is one of the most amazing stories I’ve ever read. Like I just did not know that this sort of thing happened. I’m am glad to see you survived and potentially even have a better life now than you did before. I only knew parts of the story. I am glad I came here to read your whole journey. What a tremendous spirit you have! I lost one of my very best friends five years ago to breast cancer, and she left behind a six-year-old daughter. That was definitely the hardest part of her passing. I am thrilled to know that you will be here to raise your daughters and enjoy more of life. May blessings shower upon you as you recover, Karen. No computers were harmed in the 0.197 seconds it took to produce this page.